Acoma Pueblo, often called “Sky City,” is built on top of a near 400-foot mesa approximately 72 miles west of Albuquerque, New Mexico. 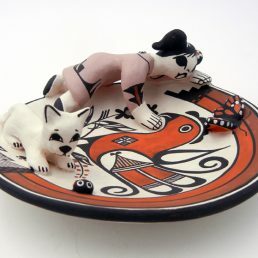 The Pueblo has been continually inhabited since 1150 A.D., and the people of the Pueblo continue to practice the pottery making traditions of their ancestors. Unpainted Acoma Pueblo pottery is characteristically a light cream, almost white color. Some vessels are left unpainted, and the austerity of the pottery’s natural color is breathtaking. 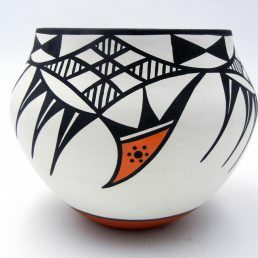 Most Acoma Pueblo pottery is painted, typically using red and orange (terra cotta) outlined in black. 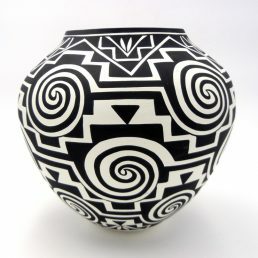 Acoma artists are known for their use of fine line designs. Fine lines, symbolizing falling rain, are painted closely together. Line direction varies to create larger geometric patterns. 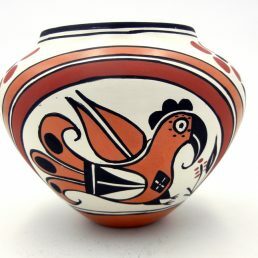 Another design common to Acoma Pueblo pottery is the parrot. Introduced by the Spanish, the parrot is special to the Acoma people; according to legend, the parrot led a group of Acoma women to a clean, cool watering hole. 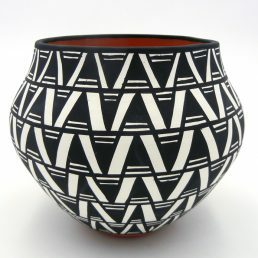 Acoma Pueblo pottery is designed to be fine and perfectly symmetrical. 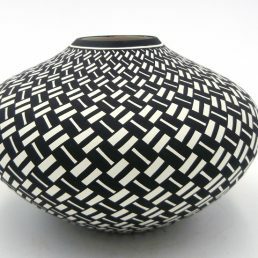 When an artist masters the craft, the piece of Acoma Pueblo pottery “rings” when lightly tapped. 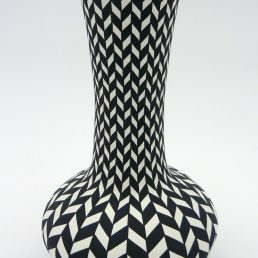 Charmae Natseway is known for her contemporary Native American Indian pottery. Largely neglecting traditional ollas, Natseway creates flasks and non-traditional cylindrical pieces. 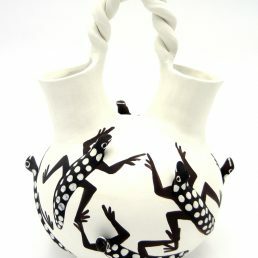 Paula Estevan‘s work is “classic” Acoma Pueblo pottery. Estevan favors repeating geometric designs, often monochromatic, which have a dizzying effect on the eye, but the precision of her lines is astounding. 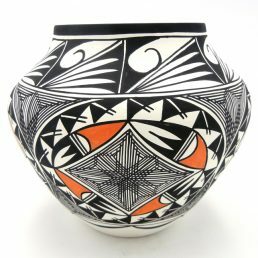 Palms Trading Company buys Native American Indian pottery directly from the artists, so we guarantee each Acoma Pueblo pottery piece is authentic. Our online selection is only a small sample of what Palms Trading Company carries in the store. 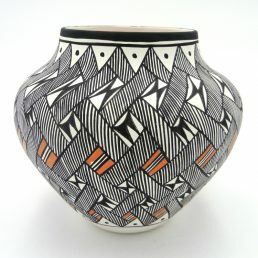 If you would like to see more Acoma Pueblo pottery, please contact us to use our personal shopper service.